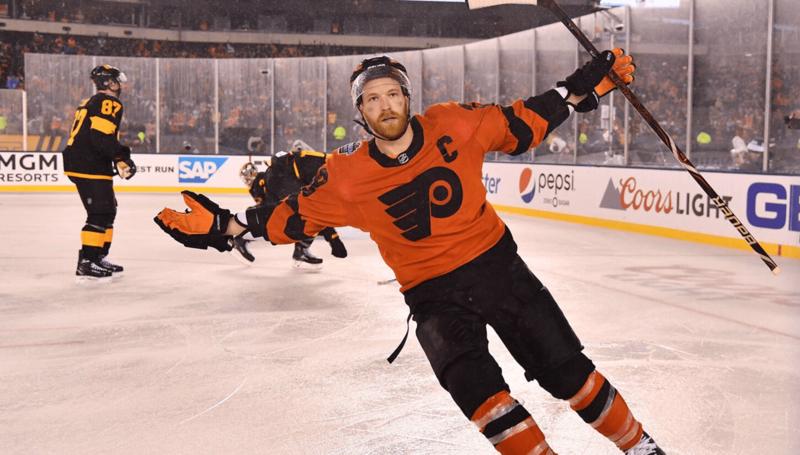 How the hell did the Flyers come back and win that game Saturday night? No, really… I still can’t believe they did. In fact, I was on the under -6.5 total goals so when Jake hit the prayer from the Owners box, the game became a blur. The Flyers scored three goals in six minutes – against the Penguins – outside – in the damn rain… all while Gritty was naked! Okay, the main reason you’re here is to see who took this ICONIC picture of Giroux after he potted the game-winner. First of all, Crosby hunched over in the back is what takes the picture to new heights. It’s still an amazing picture without him in it, but I like more subtle details. Second, the guy’s at the absolute perfect spot at exactly the right time. USA Today photographer Eric Hartline snapped the picture. A photo that G will be signing for the Flyers faithful until the very end. All that ice on the side, perfect size for his autograph, and after one of the most memorable regular season games of all-time. Question of the day: respond in the comments section or over on Twitter and give me a Philly sports photo that you will always remember? USP: The season’s finally here!